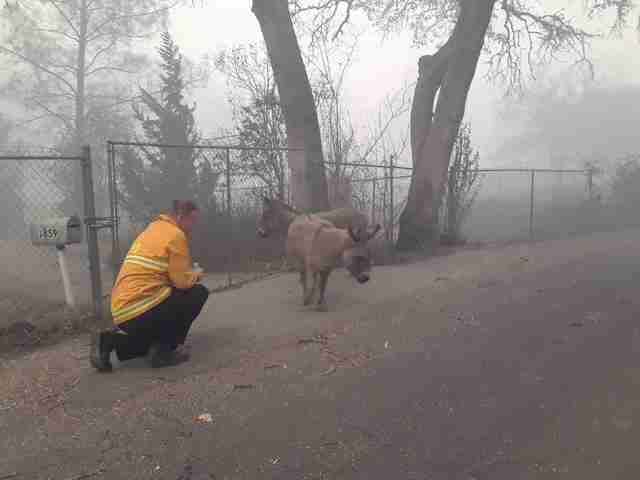 Firefighter Chris Harvey and Sacramento Fire Chief Gary Loesch were driving down Honey Run Road in Paradise, California, on Saturday when they came across something entirely unexpected. Just days before, the deadly Camp Fire had ripped through the Sierra Nevada foothill community of Paradise, leaving behind the charred remains of homes and husks of cars. 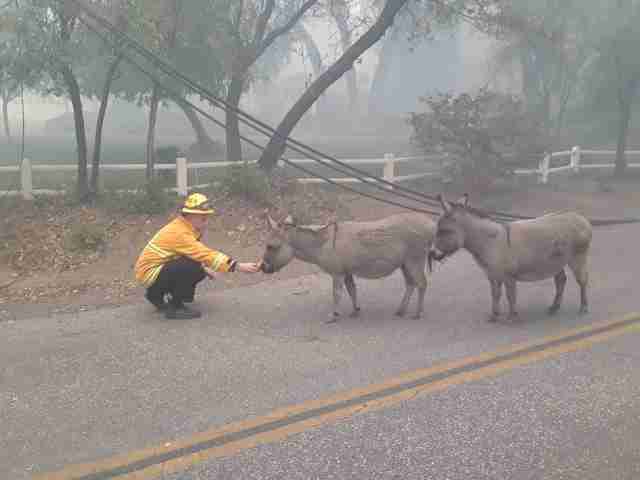 The fast-moving blaze had claimed both human and animal lives, transforming a town of retirees and young families into something eerily deserted. While en route to investigate an accident caused by a falling tree, Harvey and Loesch spotted two weary animals emerging from the smoke. The donkeys were slowly hobbling down the center of the road in the opposite direction, and it was clear to Harvey that they were very lost. Harvey knew that after what the donkeys had been through the animals needed more than a few sips of water, so he grabbed the apples out of his and Loesch’s sack lunches and fed them to the donkeys. Immediately, Harvey could see the difference that his little act of kindness made to the survivors. 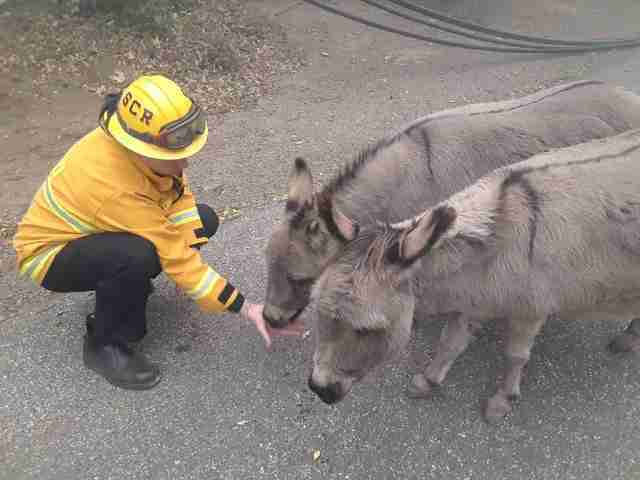 Harvey and Loesch waited with the donkeys until they were safely in the care of animal control. Though it is unknown whether the donkeys will be able to reunite with their family, their rescue is a ray of hope when people need it most. 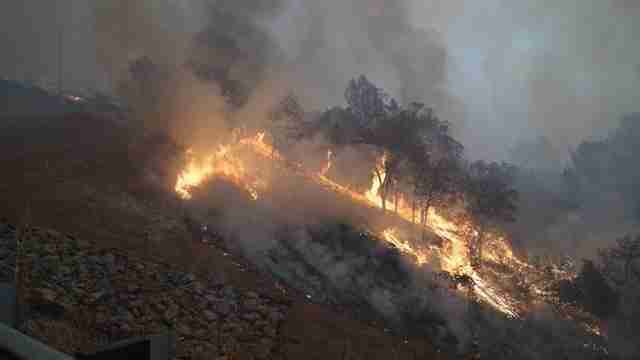 To support the victims of the Camp Fire, you can make a donation to one of the nonprofit organizations helping in the wake of this disaster, such as the American Red Cross or the California Community Foundation’s Wildfire Relief Fund. 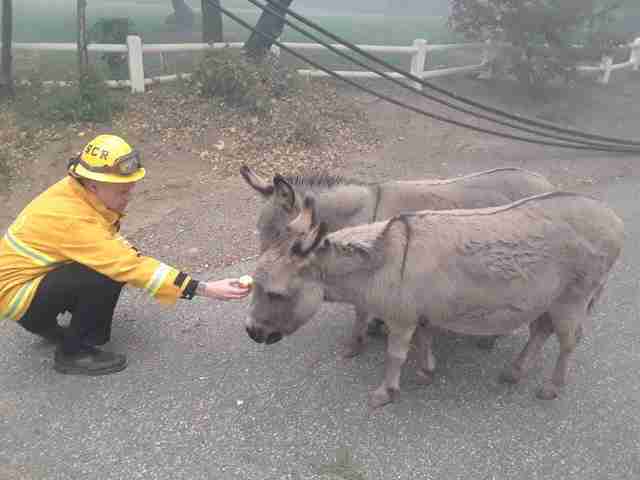 To support the HSUS's ongoing animal rescue and relief efforts, you can make a donation here.